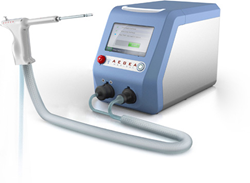 AEGEA Medical receives FDA Approval of the AEGEA Vapor System(TM) with adaptive vapor ablation for the treatment of menorrhagia. The AEGEA Vapor System is the first endometrial ablation system specifically designed for use in the doctor's office. The ease of insertion, small size, low vapor pressure, and new safety features will provide more gynecologists with the confidence to perform endometrial ablation in an office setting. AEGEA Medical, Inc., a privately held medical device company focused on the development of its patented Adaptive Vapor Ablation technology, today announced U.S. FDA approval of the AEGEA Vapor System as a new treatment option for menorrhagia. The AEGEA Vapor System is the first endometrial ablation system specifically designed for use in the doctor’s office allowing minimal anesthesia/analgesia and rapid recovery. AEGEA Medical’s technology utilizes the naturally expansive power of water vapor to deliver a safe, effective and quick endometrial ablation procedure designed to significantly reduce menstrual bleeding. The AEGEA Vapor System delivers controlled, low-pressure water vapor to the uterine cavity to efficiently ablate the inner lining of the uterus. The AEGEA Vapor System is a fully automated safety monitoring and vapor delivery system that uses a slender flexible Vapor Probe with SmartSeal(TM) technology and the Integrity Pro(TM) safety feature for an added level of confidence. The fast 4-minute procedure time includes 2 minutes of vapor treatment and can be performed in patients with a wider range of uterine anatomies than indicated for use with currently available treatments. “The ease of insertion, small size, low vapor pressure, and new safety features will provide more gynecologists with the confidence to perform endometrial ablation in an office setting,” said Dr. Kirk Brody, Chattanooga Medical Research and University of Tennessee College of Medicine. Women treated with the AEGEA Vapor System experienced a 6x reduction in menstrual bleeding per the Pivotal Study criteria, 99% experienced an improvement in quality of life 12 months post-treatment, and 93% would recommend the procedure to a friend. Clinical trials with the AEGEA Vapor System included women with uterine cavities up to 12 cm in length, any uterine width, and uterine cavities with certain types of fibroids. "The AEGEA Vapor System gives me the opportunity to help a much broader population of patients that we see every day since it works in non-uniform uterine cavities,” said Dr. David Levine, Director of Minimally Invasive Gynecologic Surgery, St. Louis Mercy Hospital. “We have realized the vision of a new treatment approach that fulfills an unmet need for patients that cannot be treated by existing endometrial ablation devices. Our approved vapor procedure expands the options for these patients that don’t want surgery or hormonal treatment and yet desire an effective minimally invasive treatment for their abnormal uterine bleeding. Adaptive Vapor Ablation can transform the experience of gynecologists and the millions of women they treat who suffer from abnormal uterine bleeding,” said Don Gurskis, President and Chief Executive Officer of AEGEA Medical. Many women experience heavy menstrual bleeding at some point in their lives. Nearly 1 in 5 women between the ages of 30 and 50 experience abnormally heavy or prolonged menstrual bleeding. Healthcare professionals call this condition “abnormal uterine bleeding (AUB)” or “menorrhagia”. The increase in quantity and duration can negatively impact every day routine activities such as work and family care. It can also make it difficult to exercise and to be socially or sexually active. The AEGEA Vapor System is indicated for premenopausal women with menorrhagia due to benign causes for whom childbearing is complete. As with all surgical procedures, there are risks and considerations associated with the use of the AEGEA Vapor System. Please refer to the device labeling for a detailed discussion of the device’s intended use, relevant warnings, precautions, side effects, and contraindications. AEGEA Medical is pioneering the application of its Adaptive Vapor Ablation technology to deliver therapies that provide high quality patient outcomes to a wider range of patients. AEGEA’s FDA approved water vapor technology enables the delivery of a safe and effective endometrial ablation for the treatment of menorrhagia in a simple, office-based procedure that takes only minutes. With a vision to expand safe and effective treatment options to more patients, and provide physicians with the confidence and convenience necessary to perform office-based procedures, AEGEA is inspiring new approaches to women’s healthcare. Founded in 2008, AEGEA Medical is located in Redwood City, California. For more information, visit AEGEAmedical.com. AEGEA Medical, AEGEA Vapor System, SmartSeal, and IntegrityPro, and associated logos, are trademarks and/or registered trademarks of AEGEA Medical.